Chesapeake Bay sailing crab skiffs can, with little alteration, make fast and able daysailers. These skiffs first appeared on the big estuary during the last years of the nineteenth century. The type — perhaps we should say "types" — varied wildly from creek to creek. Depending upon local conditions and prejudices, an observer at the time would have found single- and two-stick rigs, with or without headsails. Deadrise amidships (amount of V to the bottom) ranged from 0 degrees to about 12 degrees. Hulls were double-ended or transom-sterned. In fact, the diversity in skiff design allowed watermen to identify a boat as the product of a particular county, if not a particular builder. In addition to serving as their name suggests, the skiffs earned their keep in general waterfront transportation and by handling odd jobs. Although these boats went extinct half a century ago (at least as working watercraft), many of their characteristics survive in contemporary Chesapeake outboard-powered skiffs. Cross-planked bottoms, strong sheerlines, and sharp forward sections still can be seen in the working powerboats at public landings along the Bay's convoluted 5,000-mile shoreline. With its 3%-inchby 3%-inch keelson and 1-inch bottom planking, this is not a light hull. Good, old-fashioned inertia will make the boat steadier to work in the notorious Chesapeake chop and will give it the power to punch through now-ubiquitous powerboat wakes. No matter what miracle goops and goos we might employ in building this skiff today, I'd suggest not taking too much weight out of its structure. Two Chesapeake Skiffs the boom to the mast). Sail twist can be varied by changing snotter tension and/or by sliding the snotter up or down the mast. Although the curve drawn into the foot of each sail looks fine, our sailmaker will know to cut the bottoms of the sails dead straight to better handle the tension. While we're at it, let's ask him to cut the mainsail somewhat fuller — and with the point of maximum draft farther forward — than he would for, say, a tautly strung sloop. Because the mizzen often will be sheeted closer than the mainsail, among other reasons, it ought to be sewn relatively flat. At the size we're discussing, these rigs need no ready-made hardware. Absolutely none. Dumb sheaves (well faired and lined holes worked through the sticks near their heads) will substitute for halyard blocks. The single-part sheets need only a bowline at one end and a figure-of-eight knot at the other. Rope snotters do the work of stainless-steel or bronze gooseneck fittings — and then some. We might note that this skiff and the Cambridge boat have their centerboards located far forward by yacht standards, and the boards are slightly smaller than expected. This arrangement has obvious advantages in working skiffs, and the added cockpit room will be appreciated in the daysailing derivatives. The happy configuration is made feasible by the forward bias of the sail plans' geometrical centers and by the far-aft lateral plane offered by large skegs and rudders. Before dropping the rig from the old skiff into the new skiff, Parker lopped about 20 inches off the mast. 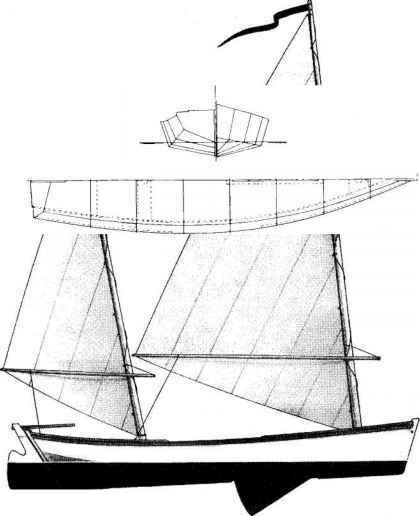 As indicated by the vertical dashed line drawn on the sail, he added a traditional vertical slab-reefing system that was sometimes used for larger sharpies. Details of this arrangement can be found on page 66 of Chapelle's book, Boatbuilding (W.W. Norton & Co,, New York, 1941). Casual inspection of the contemporary waterfront suggests that too many raceboats masquerade as day-sailers — their shallow cockpits fouled by nests of lines, and nary a seat in sight. Old skiffs from the Chesapeake offer secure and comfortable alternatives. Plans for the Simmons Cambridge skiff, as drawn by Howard I. Chapelle, can be obtainedfrom Ship Plans, NMAH 5010/MRC 628, Smithsonian Institution, Washington, DC 20560. Ask for CBCSplan No. 4. 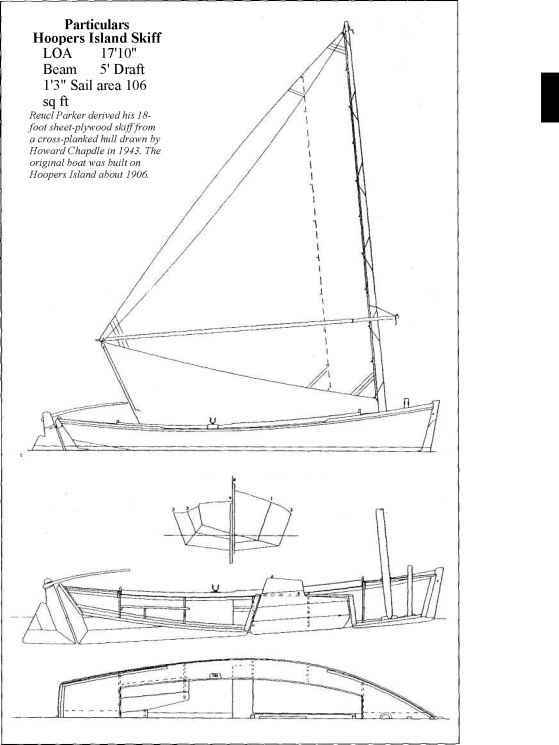 Plans for Reuel Parker's version of the Hoopers Island skiff are available from Parker Marine Enterprises, P.O. Box 4102, Key West, PL 33041. Ask for the 18-foot modified sharpie skiff. A sharp forefoot will keep the Cambridge skiff quiet at anchor and help it settle in quickly on a new tack. How to cross plank a skiff? Where is the 32 ft. chesapeake deadrise boat located now? 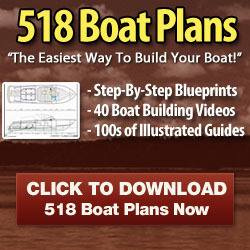 How to plank the forefoot portion of a dead rise work boat? How to make a cheasepeake bay skiff? Where to get chesapeak deadrise plans? How to build a crab skiff?